There is this saying – “go with the flow” – and it generally means to go along with the crowd, with your feelings, with “whatever!” It does not mean to rock the boat. Here in Moab, with the Colorado River running just north of town the saying is often ascribed to rafting or river running. WRONG! Any decent boater will tell you that if you go with the flow you’ll end up in an eddy, on a rock, over the falls, or getting flipped! It’s NOT good river advice to “go with the flow.” Don’t believe me. 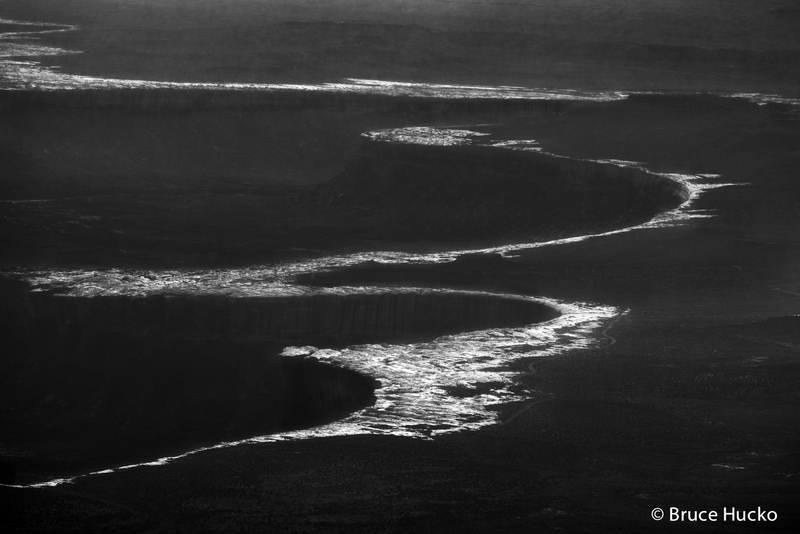 Try taking your oars out of the water next time you go through Cataract Canyon or even White’s Rapid on the daily. Call me when you’re dry. This past weekend I enjoyed two nights of floating on the Colorado River through the Ruby/Horsethief section of the canyon. It’s simple and simply beautiful. Our camp on the second night was at Black Rocks. The stone lining this narrowing of the river channel is pre-Cambrian, 1.7 BILLION years old! This means it is some of the oldest exposed rock on the face of the earth. It was a particular pleasure to camp among these rocks. We made camp in the afternoon and it was about 95 degrees out. The best activity was to find shade or just sit in the river. My two companions and did a bit of both. As shadow traced an erratic line across the river towards us I went scouting. No further than the next campsite upstream (and not occupied) I found a section of this ancient gneiss schist that I’d spend the evening with. 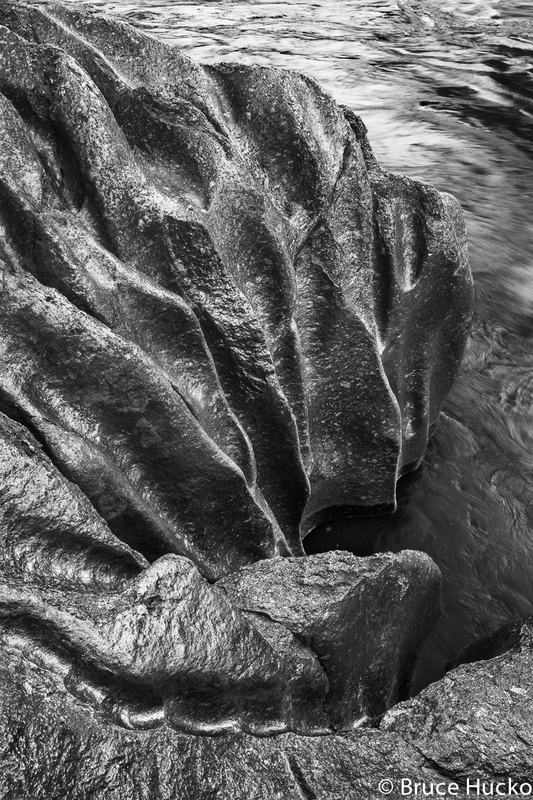 This image was made by “going with the flow” of the fluted stone. It seemed to drain the land from left to right where it met the river. The stone was pinkish grey in daylight and in shade the highlights were reflecting the blue of the sky. Though I have a color version that I like I really do prefer the BW. 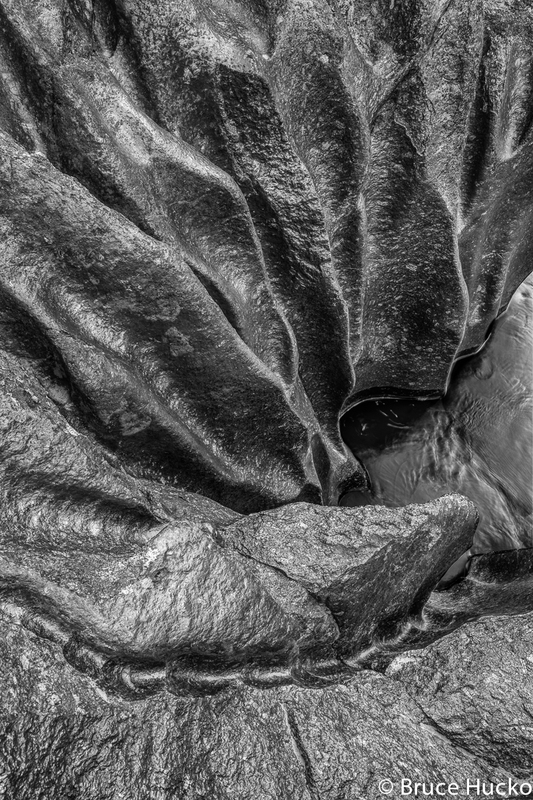 For me, it brings out the dynamic movement I saw and felt in the stone as I imagined eons of water draining through and making the form I reveled in today. I’m showing you both versions, one with a bit of the river beyond and the other without…..I like them both. This next image is one I’m quite happy with. I’d only been staring it in the face for the whole afternoon and evening….and the morning after until we launched. My raft was about 8′ to the right. The river laps the sandy beach on which we were camped about one foot under the bottom of the frame. My sleeping and shade area was 10′ from there. I knew there was something there, but all I could think of initially was the White Tree of Gondor (Lord of the Rings, Tolkien). 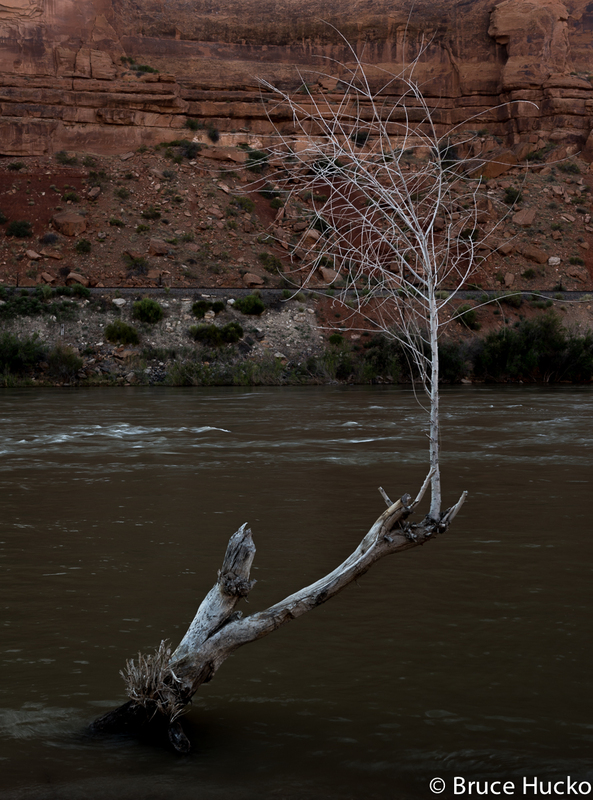 It was in direct sun initially, but as the world turned (the sun does not go down), first the background cliff, then the river and finally the tree entered into open shade. 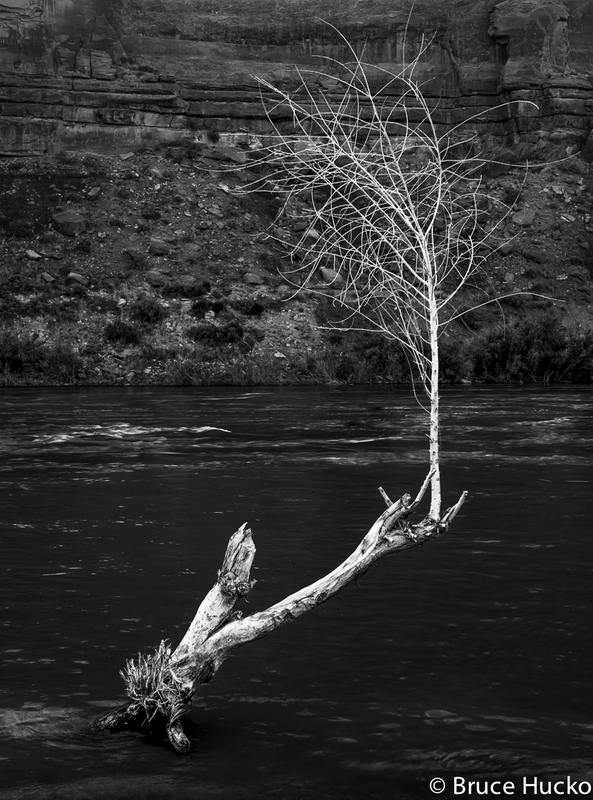 At this point the tree glowed…..seemingly from within and the main trunk, still embedded in the sand seemed more like a long arm arising from the river with one if its fingers offering new life. This got me going enough to get out my gear – Nikon D810 with 24-70 zoom with the Singh-Ray Variable Neutral Density/Polarizing filter on to blur the fast moving current. Here’s the capture. I like to “go with the flow” of such thought when I am photographing because they are key to making images that are personally meaningful rather than a record of some landscape somewhere. Such thoughts inform my composition on site and my processing goals…….which start on site and end at home. I made 7 captures making slight adjustment to the filter and its effect on the water. Satisfied, I put things away and joined my compadres for a second round of Gn’Ts!!! In Lightroom I first wanted to neutralize the entire background. 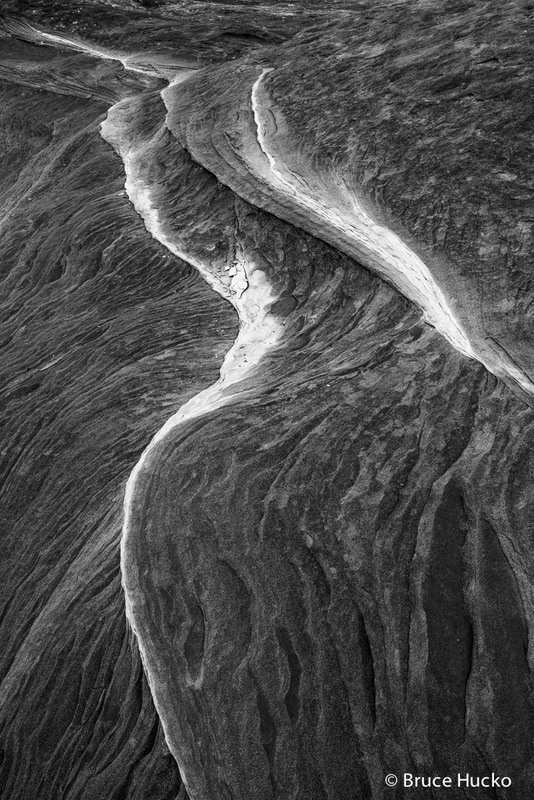 This meant darkening the top left and right corners and portions of the stone across the top of the image. Yes, that is a railway (California Zephyr and others). I darkened the area left of the tree with the lighter stone so it matched the rest. I then went to Photoshop to use the cloning tool to take out the railway and power lines. We’re still in color at this point. 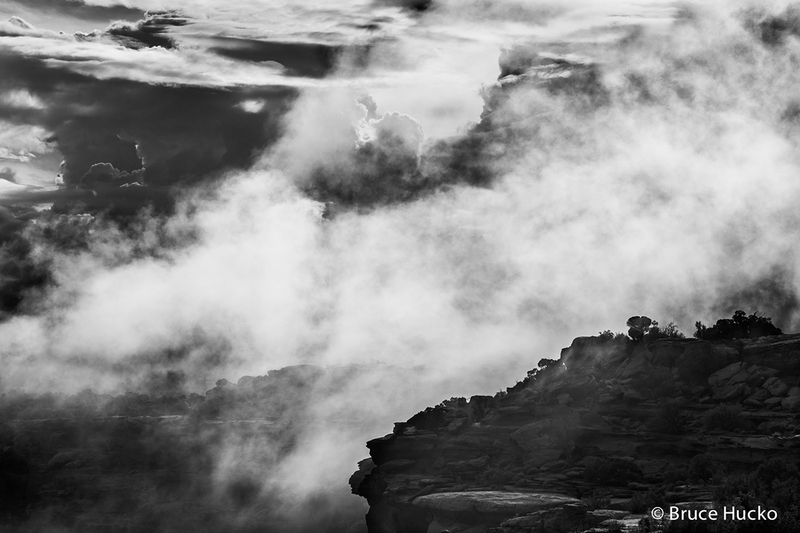 At this point I enacted the BW layer in Photoshop and altered the orange slider to control the tone of the cliff. I then added curve layer to the whole image and added a little contrast making sure the tree glowed. I then went local, first using the Healing Brush to remove some spots, rocks and wave tips that didn’t suit me. Back in LR, I used the Adjustment Brush to lighten the thicker part of the tree. I also added contrast to everything below the waterline on the far side of the river, darkening it a bit to almost create a feeling of foreboding. I don’t know why but that’s what I was thinking. I think it has something to do with seeing that the main trunk had been chewed on by a beaver and the tree being all white meant it was dead! Go with the flow…….unless you’re in a boat on a river with rapids! Posted in Uncategorized on June 6, 2017 by Bruce Hucko.